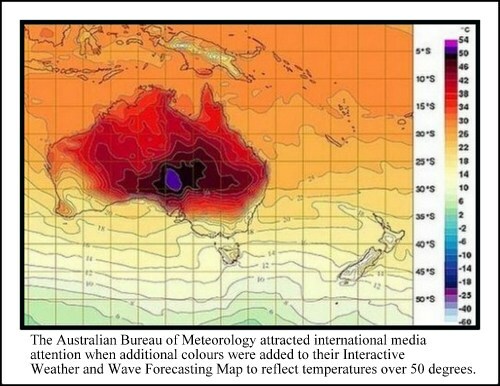 A recent report from the Australian Climate Commission has called the current Australian heatwave unprecedented in measurement records, in terms of the length, the severity and the spread of the high temperatures. “Climate change has contributed to making the current extreme heat conditions and bushfires worse” says the report Off the Charts: Extreme Australian summer heat. As average temperatures continue to rise, the report explains, the likelihood of extreme hot temperatures rises with it. The report then sets out how higher temperatures affect bushfire conditions, how rainfall and temperature patterns have changed in Australian States over the recent decades, and further how the heat affects individuals. The assertion that climate change is having a real impact on extreme weather events is supported by the 2012 report published by the American Meteorological Society Explaining Extreme Events of 2011 from a Climate Perspective. This report examined peer reviewed studies and the climate information available around six extreme weather events of 2011, to determine whether and how much the chance of such events has increased as a result of climate warming. Although it is impossible to say whether any particular event – be it Hurricane Sandy, the floods in Australia in 2011 or the 2011 heat wave in Texas – is “caused” by climate change, we can look at the likelihood of such events occurring. As an example the Texas heatwave was partially influenced by the natural El Niño weather pattern. But the report found that the chances of such a heat wave occurring during an El Niño event have increased 20 fold as a result of global warming. Another key finding of the Climate Commission report is that sound community understanding of the risks associated with climate change is critical if we are to stop or reverse the effects of global warming, and to ensure we prepare sufficiently for the effects of the warming that is already here, such as the increased risk of catastrophic bush fires. Thank you for this post! I had read about the Aust. Climate Commission report but couldn’t remember where or who it was by. I was hoping to back up a recent post I did on people being apathetic about climate change. I like this informative post. Hi Linda, Glad I could locate it for you 🙂 I’ll have to come and read your post on apathy, which is really the most scary response to climate change I think.